There has been a good deal of talk recently about the JJ Abrams reboot of the Star Wars franchise. This prompted a friend of mine to comment on Facebook: “I haven’t had the chance to get all excited about the new Star Wars trailer, what with me being an adult and all.” Judging from some of the comments on her thread, it appears that some people weren’t pleased with her comment. Yet I think there is an arrested development aspect to this whole Star Wars phenomenon. Most of us first encountered these movies when we were young and our tastes were still largely unformed. Since then, we insist on believing that there is something magical about these films, even though they’re actually not that good. I think we have all had the experience of going back to a favorite book or movie or TV show from our childhood and being dismayed to find that it’s not nearly as good as we remember it being. Our continuing obsession with Star Wars, and our desire for more Star Wars films seem to be an attempt to deny this experience. 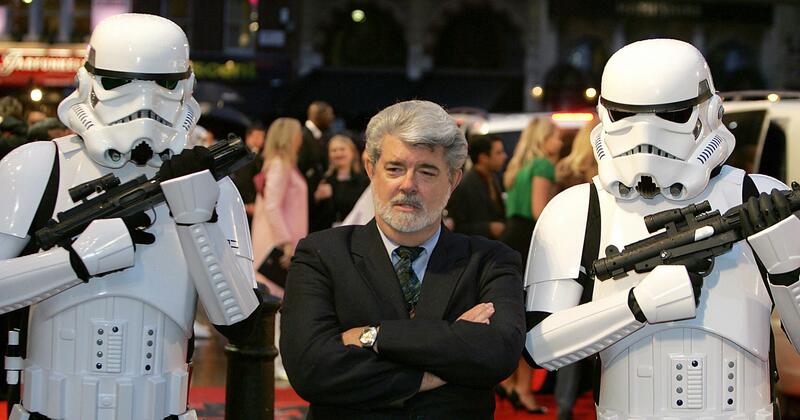 What bothers me about the Star Wars films is that they invite us not to think. Because when you think about them, you begin to realize that there are all sorts of things in them that don’t really make sense. (Science fiction purists hate these movies because they make a mockery of the notion that sci-fi is about “ideas”. By the way, the recent film, Ex Machina shows that science fiction really can be thought-provoking.) So, better not to think and to just be awed by the spectacle of it all. As someone who has always valued films that challenge me to think, I can’t help but see Star Wars as a denial of what I most value about cinema. Lucas has occasionally been compared to Wagner, which is not always meant as a compliment. For example, Lucas is, like Wagner, obsessed with prequels. (Wagner had originally set out to write just an opera about Siegfried, but he felt he had to explain everything that happened before, which resulted in the Ring cycle.) But the comparison isn’t just about size. Critics have accused Wagner of cheapening the myths upon which his operas are based. Likewise, the afore-mentioned science fiction purists have accused Lucas of cheapening the genre. They object to the way these films wallow in all the hackneyed conventions of comic books and Hollywood B-movies. He should have been a film critic.